Although you should perform algae control and maintenance regularly and never allow your pool to turn green, sometimes things get out of hand, and you need to deal with them like a pro. 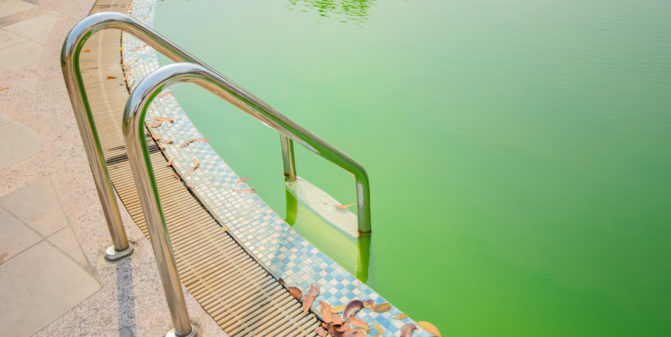 Luckily, there is a way you can turn your pool from milky green to clean easily. First and foremost, you want to prepare the pool and make sure you remove from the pool as many of the large debris as possible, even if it means the water will get stirred and look even worse. Before moving to pool shock, you will have first to determine whether the water chemistry is still within limits or it is already way off. If things have gone wrong, and you cannot see beyond six to eight inches into the surface of the water, then you won’t be able to fix your pool chemically. Such extreme cases ask for a direct drain – but hopefully, you haven’t reached that point. Yet. If the view is still not that bad, you can move on to testing the water’s pH. Since cleaning your pool will be done through shocking, you want to make sure the pH is not very high. Otherwise, things might get even dirtier – or better said, extremely dirty and cloudy. Buy a pool water test kit and if it reads high, you might want to bring it back to balance. You can use muriatic acid for that – approximately one gallon. Once your pH is under 7.2, you can move on to pool shocking by adding liquid chlorine. Depending on the severity of the situation, you will have to add somewhere around 3 to 4 gallons of liquid chlorine every day, until you start to see an improvement. You want the water to get to a nice, clear light shade of green. To make the process even more effective, add a quality algaecide as well after a few hours of circulation. It is now time to start running your pool filters, 24 hours a day and backwash for approximately 3 or 4 times daily. If needed, you can go for as many backwashes as required – no harm will be done, and results shouldn’t take long to appear. After one full day of circulation, the pool should already look transformed, but it will still need a lot of brushing and filtration. If no results show up after 4 to 5 days, your filters might be damaged. If your pool’s floor is still covered with some debris after all the process, you can go ahead and vacuum them with your vacuum system or ask for some professional help. It might look like a long and complicated process, but it’s not. If you have any question about cleaning your pool or you are in need of services, don’t hesitate to contact us AT 623-939-1346. YOU CAN ALSO COME VISIT US AT OUR RETAIL STORE AND ONE OF OUR POOL CARE PROFESSIONALS WILL BE HAPPY TO HELP! SIGN UP FOR OUR NEWSLETTER TO RECEIVE NEWS, PRODUCT UPDATES AND OUR LATEST DEALS!